陈洋洋, 陈新军, 郭立新, 方舟. 基于不同气候条件的中西太平洋鲣鱼渔场预报[J]. 上海海洋大学学报, 2019, 28(1): 145-153. CHEN Yangyang, CHEN Xinjun, GUO Lixin, FANG Zhou. Fishing ground forecasting on Katsuwonus pelamis based on different climatic conditions in western and central Pacific Ocean[J]. 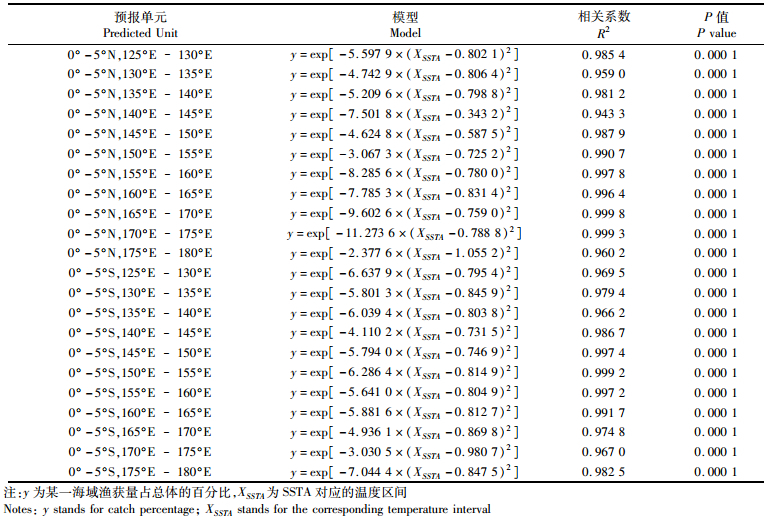 Journal of Shanghai Ocean University, 2019, 28(1): 145-153. COLLETTE B B, NAUEN C E. FAO species catalogue:vol. 2. Scombrids of the world. An annotated and illustrated catalogue of tunas, mackerels, bonitos and related species known to date[J]. FAO Fisheries Synopsis, 1983, 125(2): 83-86. 苗振清, 黄锡昌. 远洋金枪鱼渔业[M]. 上海: 上海科学技术文献出版社, 2003: 1-242. MIAO Z Q, HUANG X C. Distant water tuna fishery[M]. Shanghai: Shanghai Science and Technology Literature Press, 2003: 1-242. 谢营梁. 中西太平洋金枪鱼渔业的现状和展望(1)[J]. 现代渔业信息, 2002, 17(9): 18-20. 齐建军, 王明彦. 世界金枪鱼围网渔业的现状与前景[J]. 海洋渔业, 2001, 23(1): 18-20. 邹志来. 发展金枪鱼围网渔业的可行性研究报告[J]. 远洋渔业, 2000(6): 1-3. ZOU Z L. Feasibility study report of developing purse seine tuna fishery[J]. Distant Water Fishery, 2000(6): 1-3. 陈新军, 郑波. 中西太平洋金枪鱼围网渔业鲣鱼资源的时空分布[J]. 海洋学研究, 2007, 25(2): 13-22. HAMPTON J, LEWIS A, WILLIAMS P. The western and central Pacific tuna fishery: over view and status of stocks[R]. Oceanic Fisheries Programme SPC, 1999: 39. HAMPTON J. Estimation of tag reporting and tag-shedding rates in a large-scale tuna tagging experiment in the western tropical Pacific Ocean[J]. Fish Bulletin, 1997, 95: 68-79. 周甦芳. 厄尔尼诺-南方涛动现象对中西太平洋鲣鱼围网渔场的影响[J]. 中国水产科学, 2005, 12(6): 739-744. 汪金涛, 陈新军. 中西太平洋鲣鱼渔场的重心变化及其预测模型建立[J]. 中国海洋大学学报, 2013, 43(8): 44-48. WANG J T, CHEN X J. Changes and prediction of the fishing ground gravity of skipjack (Katsuwonus pelamis) in western-central Pacific[J]. 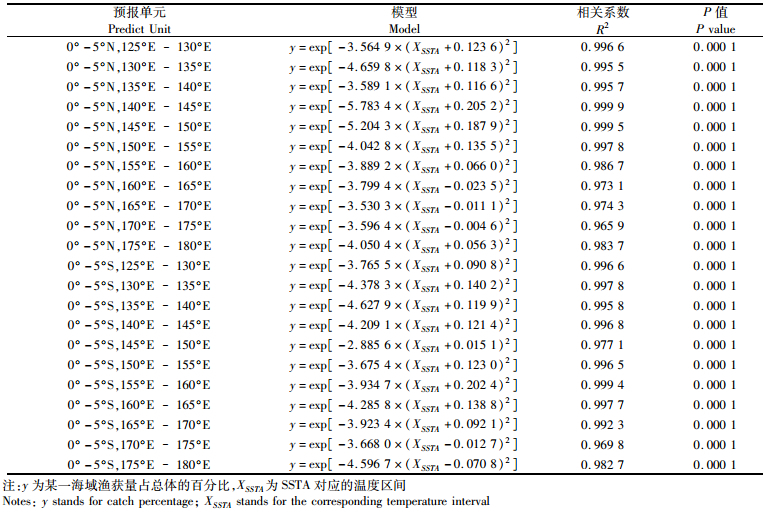 Periodical of Ocean University of China, 2013, 43(8): 44-48. 《世界大洋性渔业概况》编写组. 世界大洋性渔业概况[M]. 北京: 海洋出版社, 2011. World oceanic Fishery Status. World oceanic fishery status[M]. Beijing: China Ocean Press, 2011. 农业部渔业渔政管理局. 中国渔业年鉴2014[M]. 北京: 海洋出版社, 2014. The Ministry of Agriculture, Fisheries Fishery Administration. China fisheries yearbook[M]. Beijing: China Ocean Press, 2014. 周甦芳, 沈建华, 樊伟. 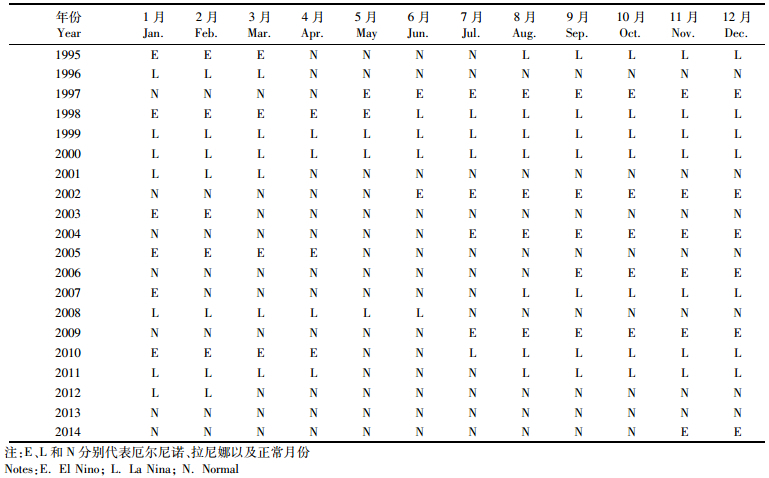 ENSO现象对中西太平洋鲣鱼围网渔场的影响分析[J]. 海洋渔业, 2004, 26(3): 168-172. ZHOU S F, SHEN J H, FAN W. Impacts of the El Nino southern oscillation on skipjack tuna (Katsuwonus pelamis) purse-seine fishing grounds in the western and central Pacific Ocean[J]. Marine Fisheries, 2004, 26(3): 168-172. 张启龙, 翁学传, 侯一筠, 等. 西太平洋暖池表层暖水的纬向运移[J]. 海洋学报, 2004, 26(1): 33-39. 钟姗姗, 何金海, 刘宣飞, 等. ENSO十年际尺度变率的机制初探[J]. 热带海洋学报, 2004, 23(2): 28-36. 沈建华, 陈雪冬, 崔雪森. 中西太平洋金枪鱼围网鲣鱼渔获量时空分布分析[J]. 海洋渔业, 2006, 28(1): 13-19. 郭爱, 陈新军. ENSO与中西太平洋金枪鱼围网资源丰度及其渔场变动的关系[J]. 海洋渔业, 2005, 27(4): 338-342. TIAN S Q, CHEN X J, CHEN Y, et al. Evaluating habitat suitability indices derived from CPUE and fishing effort data for Ommatrephes bratramii in the northwestern Pacific Ocean[J]. Fisheries Research, 2009, 95(2/3): 181-188. 陈洋洋, 陈新军. 厄尔尼诺/拉尼娜现象对中西太平洋鲣资源丰度的影响[J]. 上海海洋大学学报, 2017, 26(1): 113-120. CHEN Y Y, CHEN X J. Influence of El Nino/La Nina on the abundance index of skipjack in the western and central Pacific Ocean[J]. Journal of Shanghai Ocean University, 2017, 26(1): 113-120. 魏联, 陈新军, 雷林, 等. 西北太平洋柔鱼BP神经网络渔场预报模型比较研究[J]. 上海海洋大学学报, 2017, 26(3): 450-457. WEI L, CHEN X J, LEI L, et al. Comparative study on the forecasting models of squid fishing ground in the northwest Pacific Ocean based on BP artificial neural network[J]. Journal of Shanghai Ocean University, 2017, 26(3): 450-457. 苏新红, 金丰军, 杨奇志, 等. 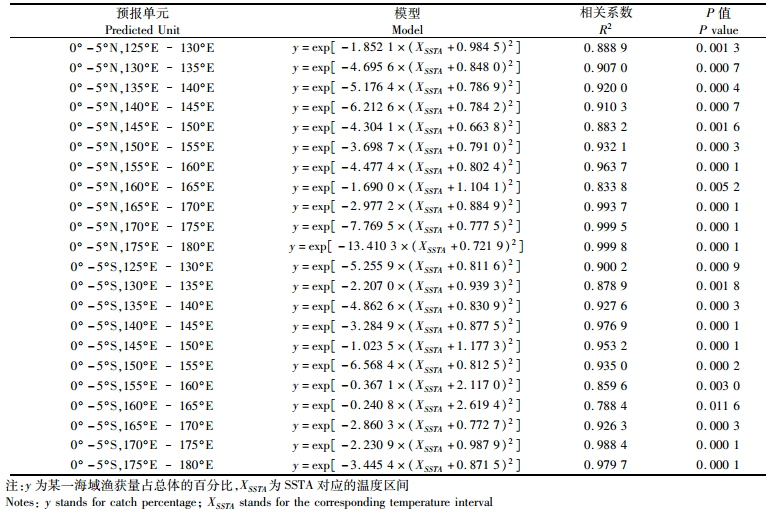 基于BP神经网络模型的福建海域赤潮预报方法研究[J]. 水产学报, 2017, 41(11): 1744-1755. SU X H, JIN F J, YANG Q Z, et al. 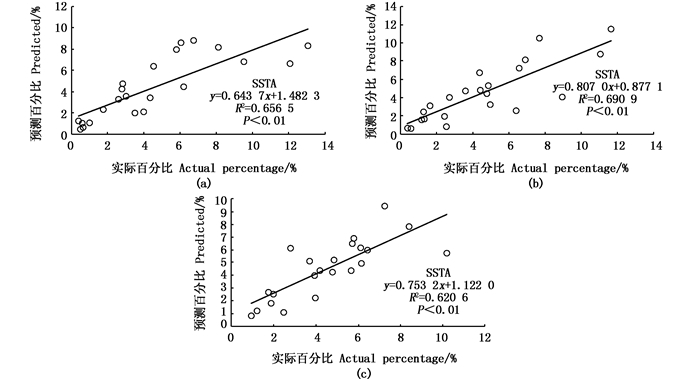 Red tide forecasting model based on BP neural network in Fujian sea area[J]. Journal of Fisheries of China, 2017, 41(11): 1744-1755. 蒋瑞, 陈新军, 雷林, 等. 秋冬季智利竹(竹夹)鱼栖息地指数模型比较[J]. 水产学报, 2017, 41(2): 240-249. JIANG R, CHEN X J, LEI L, et al. A comparative study on habitat suitability index of Trachurus murphyi during autumn and winter[J]. Journal of Fisheries of China, 2017, 41(2): 240-249. 王易帆, 陈新军. 中西太平洋鲣栖息地指数预报模型比较研究[J]. 上海海洋大学学报, 2017, 26(5): 743-750. WANG Y F, CHEN X J. Comparisons of habitat suitability index models of skipjack tuna in the Western and Central Pacific Ocean[J]. Journal of Shanghai Ocean University, 2017, 26(5): 743-750. 余为, 陈新军, 易倩. 不同气候模态下西北太平洋柔鱼渔场环境特征分析[J]. 水产学报, 2017, 41(4): 525-534. YU WEI, CHEN X J, YI Q. Analysis of variations in the environmental conditions on the fishing ground of neon flying squid (Ommastrephesbartramii) in the Northwestern Pacific Ocean under different climate modes[J]. Journal of Fisheries of China, 2017, 41(4): 525-534. 段丁毓, 陈芃, 陈新军, 等. 基于灰色系统的秘鲁鳀资源量预测模型的构建[J]. 上海海洋大学学报, 2018, 27(2): 284-290. DUAN D Y, CHEN P, CHEN X J, et al. The construction of biomass forecasting model for the anchoveta (Engraulisringens) by the grey system model[J]. Journal of Shanghai Ocean University, 2018, 27(2): 284-290. Abstract: Based on the purse seine statistical data of skipjack tuna in western and central Pacific Ocean during 1995-2014, 22 high catch fishing zone were selected, taking catch data as the index and combining different climatic conditions divided by the Nino index, to establish the forecasting model of Katsuwonus pelamisin western and central Pacific Ocean based on the different climatic conditions.The results showed that:the catch of skipjack fluctuated among different climatic conditions, the monthly total catch and monthly mean catch in El Nino were the highest, which was similar to La Nina, and higher than the normal condition; the catch among different spatial and climatic conditions had difference, the catch in 5°N was higher than 5°S, and the normal condition had the highest catch; La Nina event was the highest between the 145°E-165°E; La Nina was the lowest eastward of 165°E; the relationship between catch and SSTA of Nino 3.4 was established, and the above two indexes had strong relationship, fit well with the Normal Model (P < 0.01). The model validation result showed that predicted results and actual results fitted well and had significant relationship in all the three climatic conditions. The spatial catch variation of skipjack tuna was analyzed under three different climatic conditions in western and central Pacific Ocean. The model can effectively provide new idea for the future work of fishing ground prediction and forecasting.